Home › Toys › Set Of 4 Sports Balls With 1 Pump 5" Soccer Ball 5" Basketball 5" Playground ..
Set Of 4 Sports Balls With 1 Pump 5" Soccer Ball 5" Basketball 5" Playground ..
Includes 4 balls & 1 x pump, 1 each of 5" Soccer Ball, 5" Basketball, 5" Playground Ball, and 6.5" Football. Small size for small hands. Balls are made from durable PVC (EU & USA approved phthalates free PVC). They are NOT foam balls and come without foam layer/padding. Conforms to the safety requirements of EU EN71, US CPSIA & ASTM F963. Safe to use. 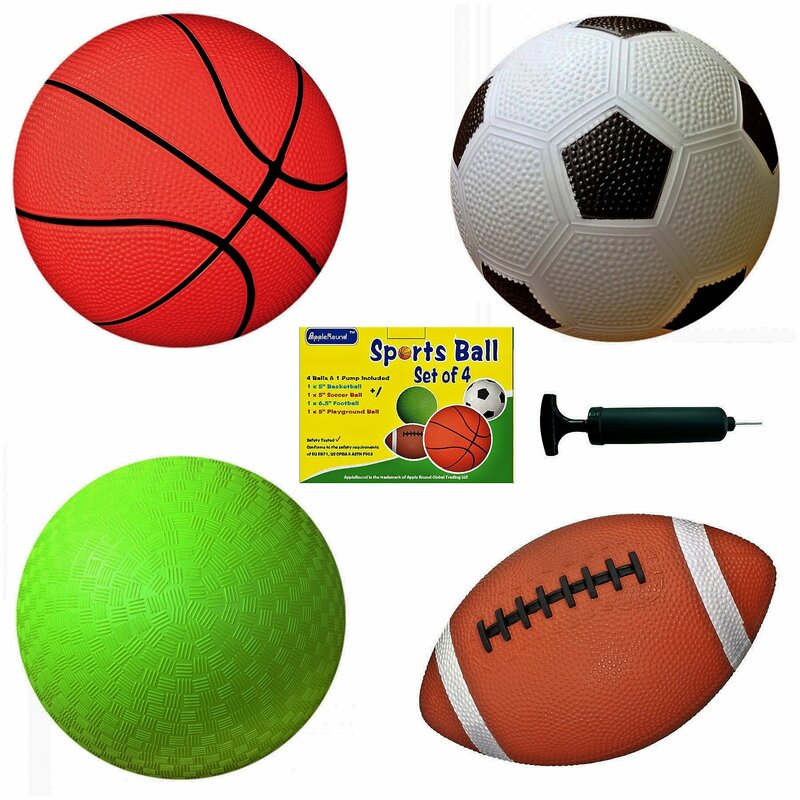 The sports ball set includes 4 balls & 1 x handy air pump, 1 each of 5" SoccerBall, 5" Basketball, 5" Playground Ball, and 6.5" Football. Ball weight ofeach is 120 grams. Balls are soft to catch and easy to grip, perfect for age group of 3 to 5years (not recommended for age 6 and up). Ball are inflatable and delivereddeflated, color box packaging and ideal as a sports gift for little kids. Balls are made from durable PVC (EU & USA approved phthalates free PVC). Theyare NOT foam balls and come without foam layer/padding. Balls conform to thesafety requirements of EU EN71, US CPSIA & ASTM F963. Safe to use. Easy inflation & deflation: Inserts the needle with the pump into the air holefor inflation; Insert the needle only without the barrel of the pump fordeflation. No additional plug needed to close the air hole. Pump is NOT a toy,and for adult use only. Replacement & Refund Should pump or ball be faulty, please 'Contact Seller'directly (other than Amazon Customer Service) from Amazon Buyer Centralagainst your order for a replacement or refund. Seller aims to provide hassle-free after-sales service and usually replies most emails in 12 hours.